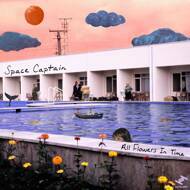 ‘All Flowers In Time’ is the debut album from Space Captain, built around the themes of love and nostalgia with a pinch of bitterness and betrayal. With intricate arrangements of fluttering guitars, sparkly keyboards, and cyclical layers of background vocals, all bound together with dreamy indie-pop melodies for a sweet curve-ball of a finish, this beautifully crafted release takes the Brooklyn 7 piece to new heights. Extensive influences range from Thundercat through Amy Winehouse to Bon Iver, but Space Captain are never anything but themselves, as this release shows. It sees the band moving away from the electronic and experimental sounds of their previous EP, instead taking them back to when they first formed, whilst also pushing the boundaries of their familiar R&B realm. For the band, ‘All Flowers In Time’ quite literally signifies the flowering of their careers and the work they have put in to get there.